WEST COLUMBIA, SC -- Taylor Jackson is many things at Brookland-Cayce High School: a member of the Math Honor Society, National Honor Society, a Bearcat Ambassador and a varsity volleyball player. Now, she can add entrepreneur to the list. 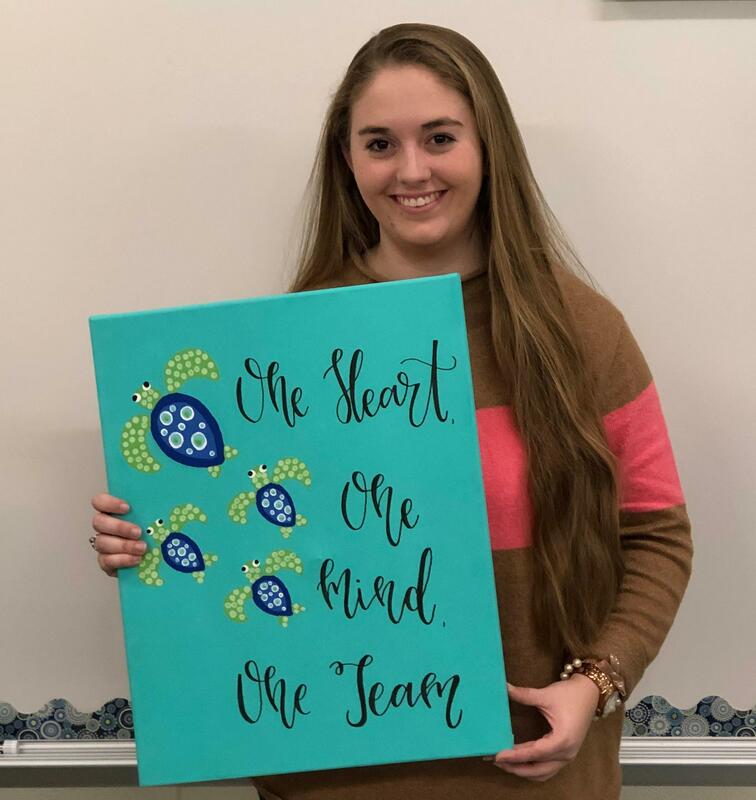 The senior started making signs for classrooms and other areas in Lexington Two’s Riverbank Elementary, which opened in August. Her success last fall led her to launch her business, Southern Lettering. Jackson was named Student Entrepreneur of the Year by the Greater Cayce-West Columbia Chamber of Commerce. Jackson was honored, along with other award winners, at a dinner earlier this month. We talked with Taylor recently about where she got her start in art, where she got the idea for school signs and what she sees herself doing in 10 years. Question: Where did your interest in art come from? Taylor: My interest in art probably comes from the fact that I have two very creative grandmothers. I started with making duct tape crafts in elementary school. About three years ago, I began to develop an interest in calligraphy. Question: What are some of the early art projects you remember doing as a child? Taylor: As a child, I remember having multiple sketchbooks of fashion designs. I always carried around a sketchbook and some markers wherever I went. Question: Where did you get the idea for the signs at Riverbank Elementary? Taylor: I got the idea from my mother, who is a teacher at Riverbank. Last summer, she suggested that I create a canvas with her name and use the Riverbank mascot, a sea turtle. I put the canvas on Facebook and the orders started streaming in. Question: How many signs did you create, and what did you charge? Taylor: As of right now, I have created 72 signs. I charge $10 per sign. Question: It's a big step to go from making signs informally to launching your own business. Talk about your decision to do that. Taylor: After the canvas was shared on Facebook, I had more requests for different projects. With so much interest, I turned it into a business! Some of my projects have included making canvas signs for teachers at other schools and personalized notecards. I have even had requests for a wedding shower and wedding signs, as well as addressing envelopes for several events. During Christmas, I sold handcrafted ornaments and signs that I sold at the BC Winter Market. Question: How are your teachers at Brookland-Cayce helping you as you continue to grow your business? Taylor: Many of my teachers have shown an interest and have encouraged me along the way. Question: How difficult is it to juggle business, school and activities? Taylor: The biggest challenge was at the beginning of the school year trying to juggle volleyball, my business, and school. At times it still gets overwhelming, but I feel fortunate making money doing something I enjoy. Question: Do you think this business will continue after you graduate from high school and head to college? Taylor: I hope it continues after high school. I don’t think it will turn into a full-time business because I plan to study education in college. Question: What do you see yourself doing in 10 years? Taylor: In 10 years, I hope to be a middle school teacher. Question: What advice do you have for other students who might have an interest they'd like to turn into a business? Taylor: My advice to other students who want to start a business is to just do it! You never know where it can take you. I certainly never thought my business would turn into what it is now.